In late Fall, armed with a basket of paper lunch bags, a sharpie and sharp pruners, I head into the field for one of my favorite harvests of the season. 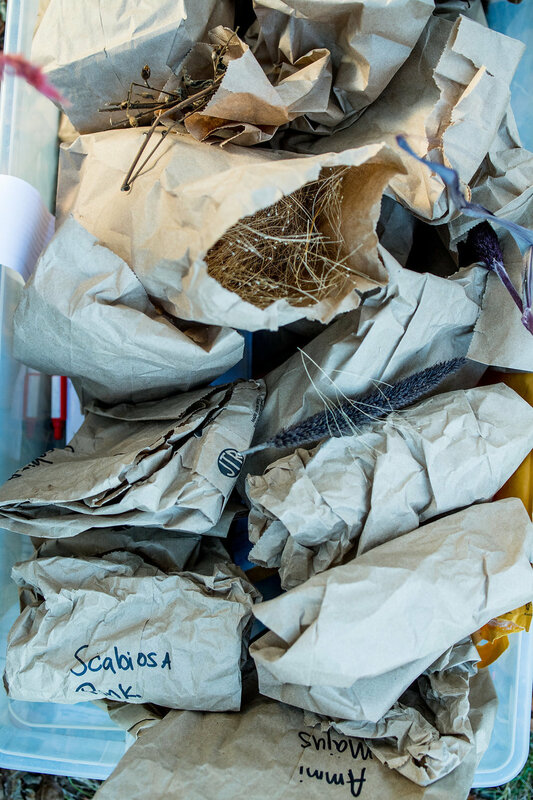 I clip fully developed seed heads of various shapes and varieties into carefully labeled bags. 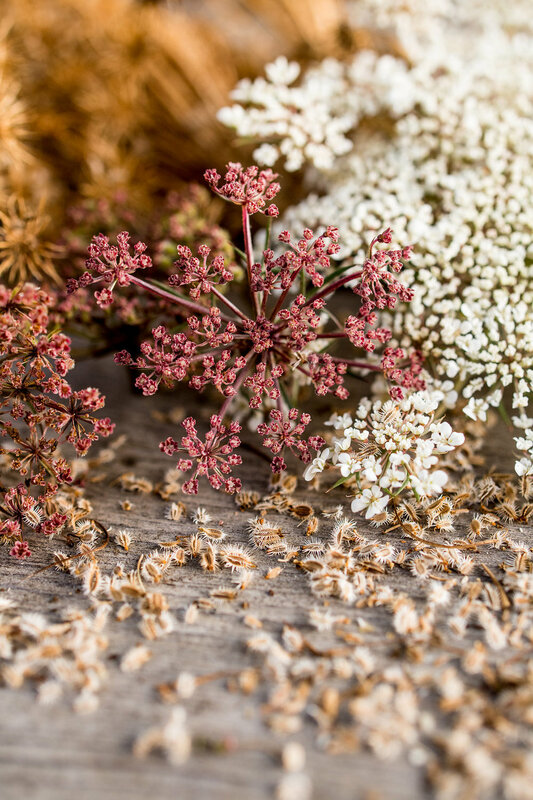 Unlike a cut flower harvest, seed head harvesting gathers thousands upon thousands of future potential plants. The thoughtful activity feels sacred, wise, ancestral and magical all at once and it seems the birds and my socks are in on the seed collecting too. I am selecting and collecting regionally adapted blooms and following in a tradition of gardeners and earth stewards before me. With the average flower seed packet ranging from three to fifteen dollars, seed saving can also make a poor farmer feel rich. On my small, but intensively planted one acre, I spend around one thousand dollars on new seed each season. While corms, tubers, and starts cost more than the seeds each year, the vast majority of plants on my farm come from seeds which I germinate each January-May in my little greenhouse. Seeds are the backbone of production and over the years I have become confident in my ability to lovingly collect and save certain seed varieties instead of buying them. During the recent fires in Sonoma County, my seed collection sat ready to evacuate at a moments notice with my passport, childhood photographs and warm clothes in the back of my truck. While there are many good seed saving books for vegetable production, more reliable guides on flower seed saving are needed. 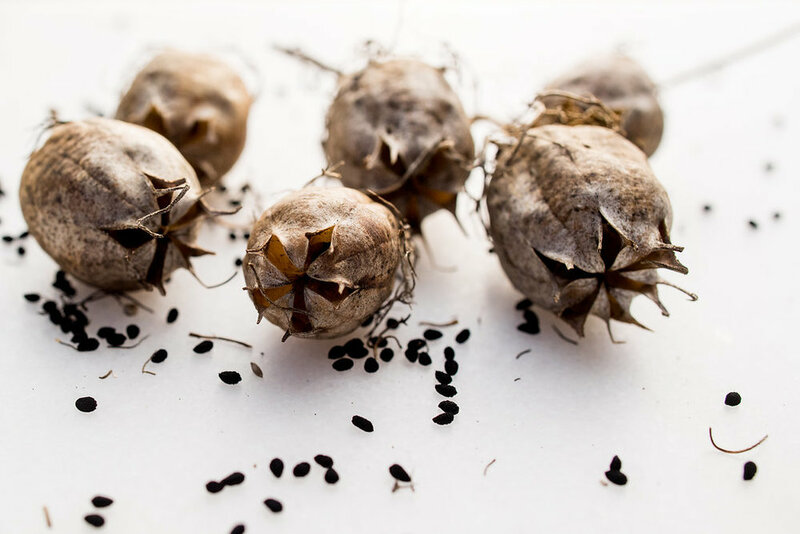 The book “Seed to Seed” by Suzanne Ashworth and David Cavagnaro and the organization Seed Savers Exchange are both excellent resources when researching general seed saving details, such as, plant families and seed production. These resources can also help you gain an understanding of open-pollinated versus hybrids and self-pollinated versus cross-pollinated which is extremely important. 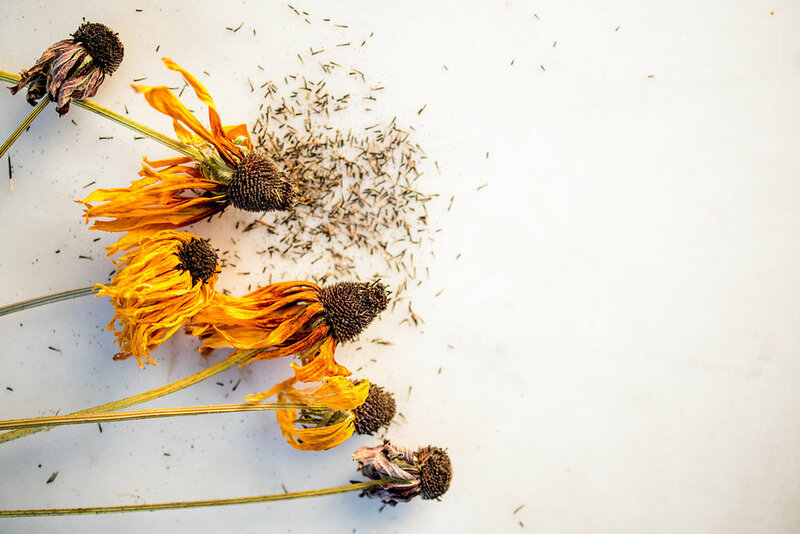 Flower seed saving information is not only hard to find, but may also vary greatly from grower to grower based on their number of varieties grown and their experience in trialing over time. 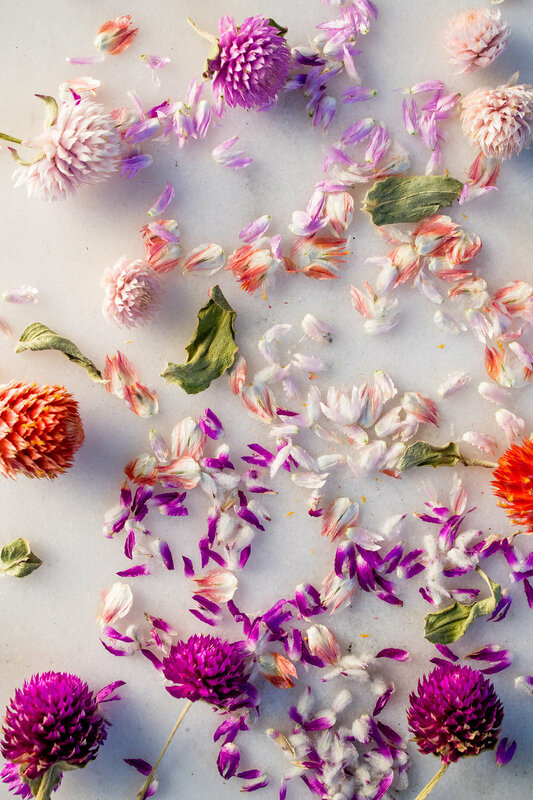 Cut flower growers aim to save seeds from plants that will come back true to color and true to height, the two most important qualities in growing cut flowers. My flower list of varieties I save on therefore is more limited than a home gardener to ensure these performance traits. Note: The bolded plants are the species I trust to save and prioritize for my operation, while the full list contains other varieties worth saving and testing. 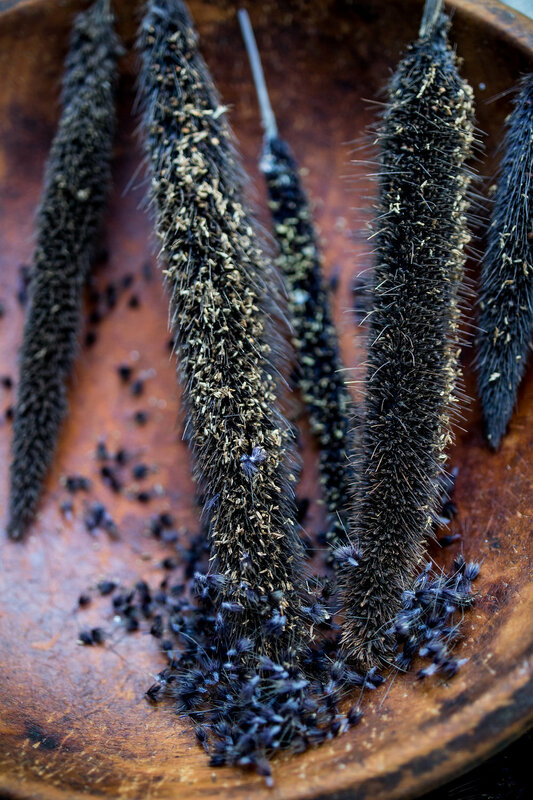 While you can save on more varieties, some species I don’t save because I plant in such large numbers that it does not make sense for me to try to process the number of seeds and/or colors that I grow. Zinnias, for instance, fall into this category. My second growing season I planted out a healthy 100-foot row of sunflowers, I had saved seed on, only to wait a couple of months and end up with only two foot tall blooming plants. If you are growing FI Hybrids, like Procut sunflowers, they may cross with a sunflower with pollen and produce undesirable variation the next season. I went from trialing fifty sunflower varieties and now only focus on ten favorite types. 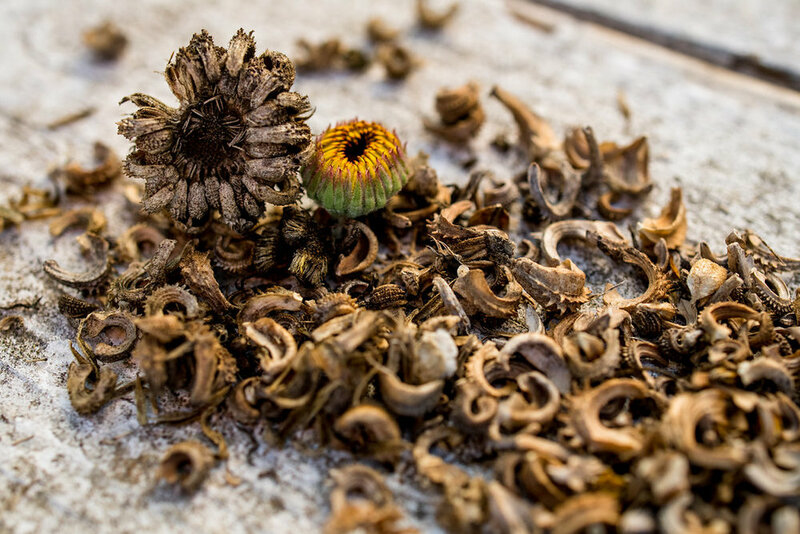 I order my sunflowers every season from Sunflower Select, which wholesales to many of the larger seed companies, and no longer save my own sunflower seed. 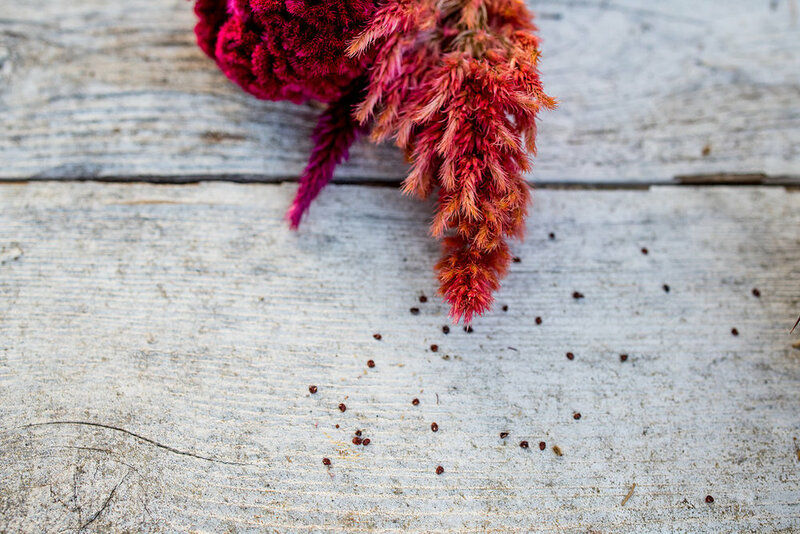 Amaranth is another easily cross-pollinated plant and since it is related to one of my main weeds, pigweed, I buy in my favorite nine varieties each season and don’t save seed on it. Although it has been fun to see my green pigweed change to some beautiful muted reds over the years, I will never forget the couple hundred feet of unusable, scratchy amaranth a friend’s farm let go to seed a few years back. While I do warn against cross pollination, one of my best selling plants is a gorgeous Ammi that is a cross between wild Queen Ann’s Lace and Dacus ‘Dara’. I named this lovely light mauve variant, Ammi ‘Hedda’s Special Blend,’ and I sell a couple hundred bunches to florists each season. The moral of the cross-pollination story is: as a grower you have to decide if you are willing to give up certainty for some unpredictable magic. Legally, there are some varieties that you cannot save and grow yourself as they are protected by plant breeders’ rights and patents. Bombay and Celway celosia are a couple of examples of protected seeds. 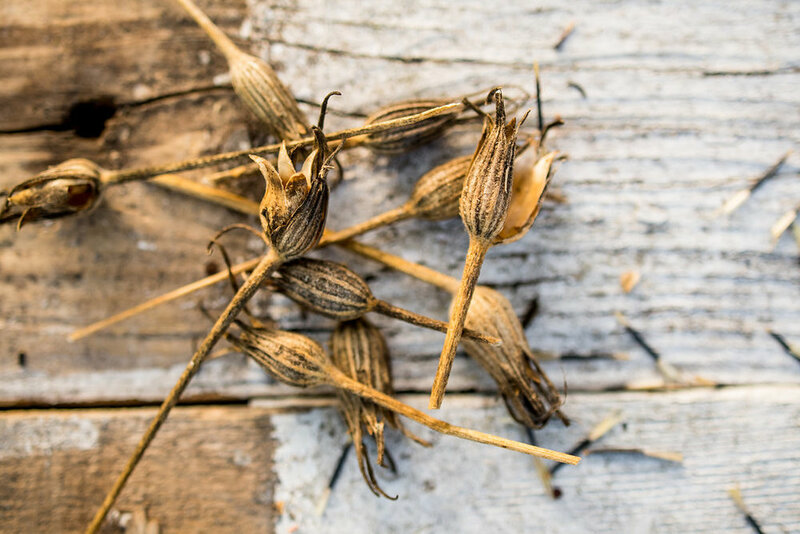 Certain seeds that need to be saved or repurchased each season are also worth noting, as they will not have a long shelf life. Some short lived seeds include all the ammi varieties, echinops, helichrysum, bells of Ireland, asters, snaps, columbines, foxglove and poppies. The smaller the seed, the less internal food storage it has and therefore a shorter seed life. So generally speaking, be careful with tiny seeds and use saved seed or purchased seed within a year. When harvesting seeds, always do so on a sunny, dry day when the seed heads are fully developed. I cut into paper bags and let sit for a couple of weeks and then process them to remove parent material through threshing and winnowing. Be sure to store in a dry space, safe from animals in low heat, ideally around 50 degrees. I use large bins with lids to keep light and insects away. I adore saving seed and I highly encourage new farmers to experiment and see what works for them. I also believe in investing in seeds that will guarantee variety quality as well. My favorite seed companies include: Geoseed, Johnny’s seed, Territorial, Gloeckner, Botanical Interest and Ivy Garth. Saving, sharing and growing seed is an exciting, political, artful act and I wish you all the joy and wonder that comes with tending plants through their various life stages.